Let’s talk about logs. Everybody logs, but what do we do with them? Do they sit on on your machines, dutifully being compressed and rotated, hoping that someone will eventually look at them? Are they greedy, taking all the disk space they can grab until someone remembers to clean them? I’d like to discuss some of the challenges we have had with logging here at Signal, and how we went about making things better. So please join me for this wild log ride. There are many really good articles that focus on setting up the ELK stack, so I won’t go into that here, but I want to more focus on the actual transport of the log data. I see a lot of people focusing on the end result, and not giving much thought on how things got there. Don’t get me wrong; not all logs are created equal, and building resiliency and redundancy into the logging infrastructure is not something that everyone needs/wants. You really need to look at the value of what is in those logs and the impact of not having that information to help you make some decisions on how much infrastructure you will need. Reliable – Does it deal with disconnections and downstream disruption? Flexible – Can I use it for all our forwarding needs? Minimal deployment/maintenance work – It should just work. Note: Make sure to define $InputFileStateFile so that rsyslog will be able to resume where it left off. As I have said before there is no “right” answer for this, and you will have to make decisions on what works best in your environment. Our production environment is primarily Amazon EC2, so some of the things we really focus on is sizing as it directly relates to costs. It’s very easy to just throw a bigger instance at things, but one of the core tenets of our infrastructure is horizontal scalability. We would much rather have more small things than fewer large ones. Size: 3 – 5 m1.xlarges. These instances offer a nice balance of memory, compute, and disk. Size: 2 – c3.larges. These instances are our go-to generic compute box. 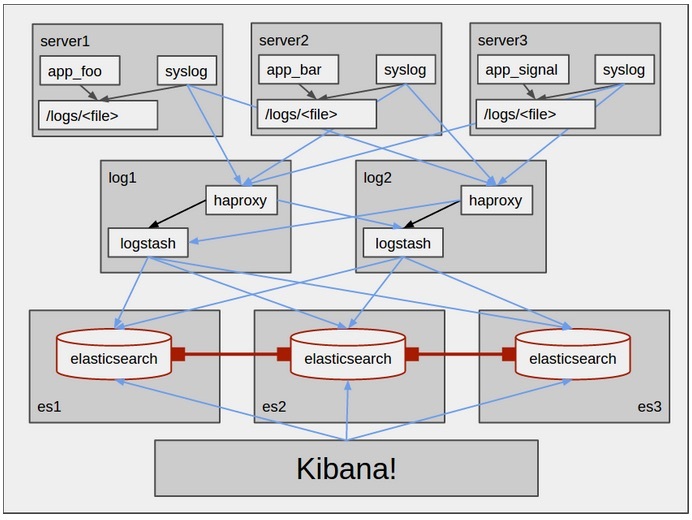 One of the next iterations of this infrastructure will involve utilizing Apache Kafka as part of this pipeline. This will give us a more fault-tolerant buffer for the messages and gives us the ability to not only replay but have multiple consumers able to process the data. We’re also excited to start storing more ad-hoc data in our elasticsearch database. We’re starting to put ‘events’ in there from various processes like deploying and when certain alert conditions are caught with monitoring tools. With this data we can annotate our grafana dashboards to watch correlations between system metrics and events just as other companies have shown, and the results are obviously very powerful for troubleshooting. Every environment is different, and the decisions you make should be based on the specifics of your infrastructure. Not trying to build a battleship the first go-round and just concentrating on solving a single problem can really help things get moving in the right direction. In the end, whether your infrastructure is big, small, local, cloud, important, not so important, don’t forget that it’s not just about where your logs end up, but how they got there. ]Let’s talk about logs. Everybody logs, but what do we do with them? Do they sit on on your machines, dutifully being compressed and rotated, hoping that someone will eventually look at them? Are they greedy, taking all the disk space they can grab until someone remembers to clean them? Every environment is different, and the decisions you make should be based on the specifics of your infrastructure. Not trying to build a battleship the first go-round and just concentrating on solving a single problem can really help things get moving in the right direction. In the end, whether your infrastructure is big, small, local, cloud, important, not so important, don’t forget that it’s not just about where your logs end up, but how they got there. Let’s talk about logs. Everybody logs, but what do we do with them? Do they sit on on your machines, dutifully being compressed and rotated, hoping that someone will eventually look at them? Are they greedy, taking all the disk space they can grab until someone remembers to clean them? Every environment is different, and the decisions you make should be based on the specifics of your infrastructure. Not trying to build a battleship the first go-round and just concentrating on solving a single problem can really help things get moving in the right direction. In the end, whether your infrastructure is big, small, local, cloud, important, not so important, don’t forget that it’s not just about where your logs end up, but how they got there. Andy Peckys was a Sr. DevOps Engineer at Signal, where he helped manage and grow a global cloud infrastructure. Having experience with high-throughput and low-latency computing, he helped Signal continue to expand their capacity to handle the ever-growing amount of traffic generated by our customers. Prior to Signal, Andy held positions at DRW Trading and JPMorgan Chase. In his free time he wrangles 6 kids and loves to bowl.